Montacute House near Yeovil in Somerset was built around 1600, at the height of the English Renaissance (Shakespeare’s Hamlet dates from around the same time). While the renaissance influence can be seen in the style and grandeur of the architecture, many of the sculptures adorning the interior and exterior of the house retain a mediaeval quaintness that is distinctly cartoony in places. 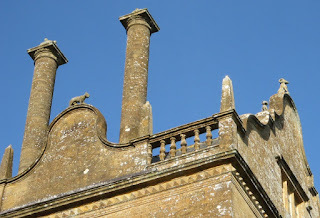 I wrote about some of these a few years ago on the Montacute House blog, but since that blog seems to have disappeared from the internet I thought I’d dig out the relevant info and pictures and repost them here. 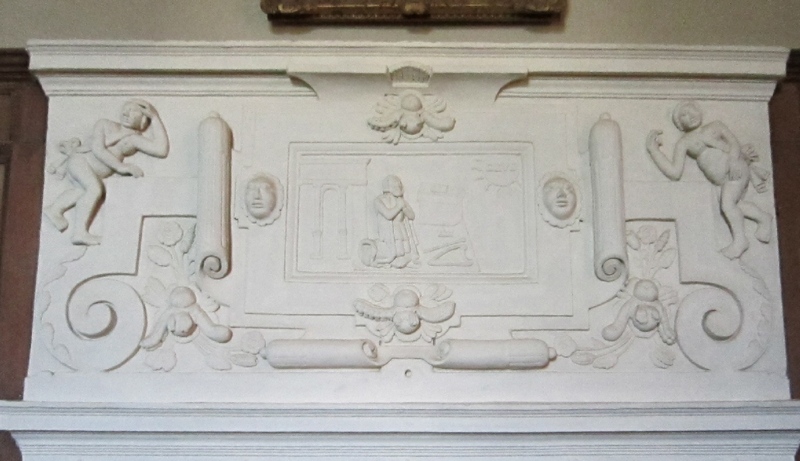 This large plaster frieze (pictured at the top of this post) is one of the most distinctive features of the Great Hall at Montacute House. At first glance it looks like a single panel, but actually it’s an early example of “sequential art”, telling an amusing rustic story in two scenes. In the left half, you can see a wife hitting her hapless husband over the head with a shoe (she must have brought this along specially for the purpose, since she already has shoes on both feet!). It seems she caught him drunk in charge of the baby – which he’s still holding onto, despite all those kegs of beer he’s been working his way through. The scene is witnessed by the man’s neighbour, who proceeds to rat on him to the rest of the village. The second scene, on the right, shows the unfortunate husband being paraded through the streets in a form of ritual humiliation known as a Skimmington ride (for the background to this obscure bit of West Country folklore, see the Dark Dorset website). 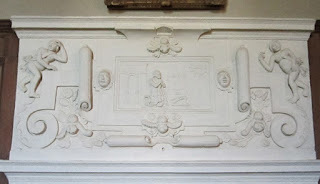 The picture above shows another plaster carving at Montacute House, this one an overmantel in one of the bedrooms. Like the Skimmington Frieze, this dates from the time the house was built – but it shows a more “mainstream” subject in the form of a Biblical scene (the praying figure is meant to be King David). Nevertheless, it’s still very naïve in its execution. The cherub on the left clearly has two right hands, while the one on the right (though it’s not quite as obvious) has two left hands! As Kid Robson has pointed out (here and here and here), the “two left hands” syndrome is one that occasionally afflicted Marvel Comics artist Jack Kirby. Moving to the exterior of Montacute House, and looking up at the parapet running around the roof, you can see a lot of strange little animals sitting on it (a couple of examples can be seen in the following photograph). The technical term for these is “hunky punks”, which according to Wikipedia is a local dialect word for a grotesque stone carving. 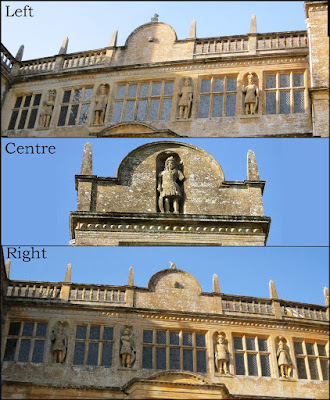 Hunky punks are most often seen on churches, but Montacute has them as well. Montacute’s hunky punks take the form of rather cute-looking animals – either chimeras (combinations of different animals) or completely imaginary species. Presumably they were the 17th century equivalent of funny cartoon animals! 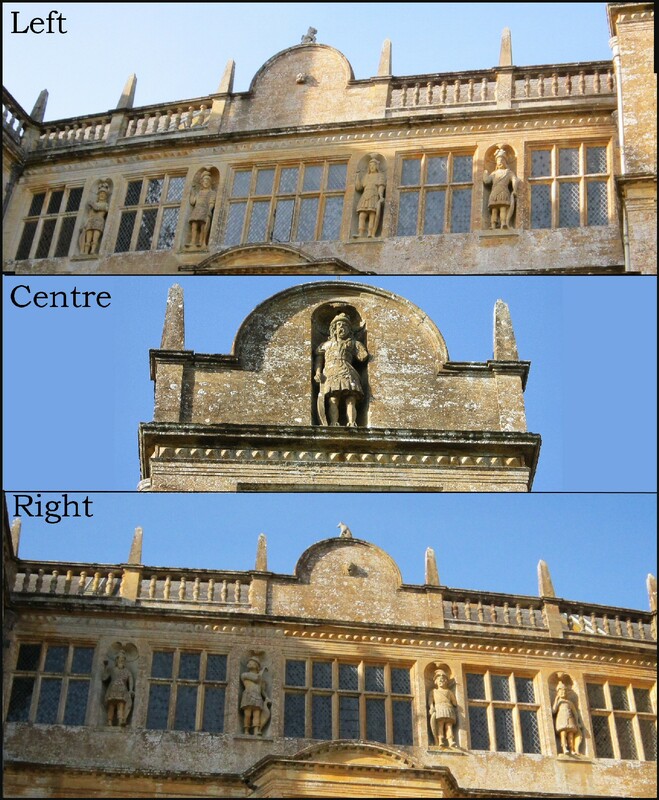 High up on the East Front of Montacute House, you can see the statues of nine figures in armour (see images below). These represent the Nine Worthies – great military leaders of history and legend, including three from classical Greece and Rome (Hector, Alexander the Great and Julius Caesar), three from Hebrew tradition (Joshua, King David and Judas Maccabeus) and three from European Christendom (King Arthur, Charlemagne and Godfrey of Bouillon). The Nine Worthies were popular throughout Europe (see their Wikipedia article) and can be thought of as a kind of crusading super-team – a bit like a mediaeval version of the Avengers!